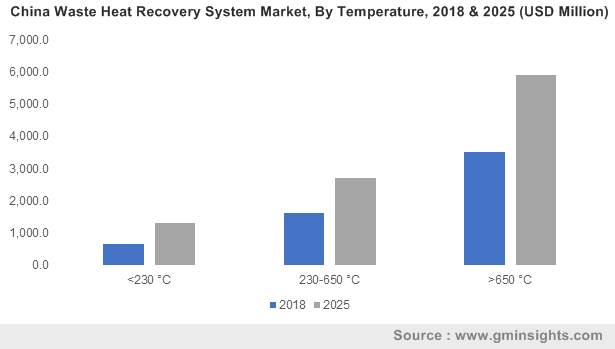 Waste Heat Recovery System Market Pdf « Global Market Insights, Inc.
How will the waste heat recovery system market outlook change over 2019-2025 with the enforcement of favorable regulations and legislative initiatives undertaken across diverse geographies? The waste heat recovery system market has shown immense potential lately, in light of the fact that authorities the world over are increasing their efforts in reversing the effects of global warming and therefore focusing on the use of renewable energy sources. For instance, the central government of India recently announced that cement plants, integrated steel plants, metallurgical industries, thermal power plants and other industries with potential to recover heat and that use waste heat recovery boilers without any auxiliary fuel do not require to get environmental clearance before setting up or expansion. The exemption is apparently to promote energy conservation and benefit industries given that they would be able to implement such energy conservations systems internally without having to go through a lengthy process of receiving environmental clearance. Considering that India is a country where industrialization and urbanization have recorded some of the highest growth rate in the world, the move has been considered exceptionally optimal for the regional waste heat recovery system industry. As such initiatives continue to be undertaken by various countries looking to promote rapid industrialization, the waste heat recovery system market will undeniably receive massive stimulus. The reason that waste heat recovery has received so much attention is because enhanced energy efficiency requirements pose a constant challenge for all industries and since price for traditional sources of energy are rising globally, there is an urgent need to reduce fuel bills to remain competitive. The general consensus on global warming says that if action is not taken now the situation may be irreversible as soon as 2020. The European Union 2020 energy package was designed to mean that EU meets its climate and energy targets for the year 2020 which included 20% cut in greenhouse gas emissions, 20% of EU energy from renewables and 20% improvement in energy efficiency. Actions that were taken to meet such goals are also partly responsible for the growth of the waste heat recovery system market. Legislative actions are possibly the most important actions taken that have the potential to drive the waste heat recovery system market as the government of any nation can add incentives or levy punitive taxes on industries for their use of energy and can therefore determine whether industries would be more responsible about the way they use their resources. For instance, the Chinese government recognizes the importance of industrial waste heat recovery and has amended the Energy Conservation Law of China in 2008 to boost adoption of waste heat utilization in industrial companies. The importance of waste heat recovery has been recognized through various national legislations. For instance in 2008, Energy Conservation Law of China encouraged the adoption of waste heat utilization in industrial businesses while China’s Circular Economy Promotion Law mandated that companies need to comprehensively utilize waste gas by following national requirements. China’s 11th and 12th Five-Year Plans both emphasized waste heat utilization to be one of the Key Energy-Saving Projects, for the improvement of thermal energy efficiency in industrial boilers and furnaces as well as encouraging the adoption of waste heat to power generation technologies in energy-intensive industrial sectors. Long term benefits of decarbonization and increasing energy efficiency of the industrial sector has also been recognized by the BEIS of UK that has launched an Industrial Heat Recovery Support Program to promote waste heat recovery. This could conveniently be one of the pivotal driving factors for the UK waste heat recovery system market which is expected to witness 7% CAGR over 2019-2025. The Industrial Heat Recovery Support Program aims at increasing industry confidence in the identification and investment in opportunities designed for recovering heat from industrial processes and increase the deployment of the technologies needed to do it in England and Wales. The program is expected to promote industrial energy bill savings of around £500 million and carbon savings of approximately 6 million tons over the course of its lifetime. With such endeavors by governments in various nations becoming more supportive of renewable energy resources, the waste heat recovery system market is expected to gain greater traction in the years to come. As per reliable estimates, the global waste heat recovery system market is anticipated to surpass a valuation of $80 billion by 2025. This entry was posted in ENERGY, MINING, OIL AND GAS and tagged Waste Heat Recovery System Industry, Waste Heat Recovery System Market, Waste Heat Recovery System Market Analysis, Waste Heat Recovery System Market Growth, Waste Heat Recovery System Market Outlook, Waste Heat Recovery System Market Pdf, Waste Heat Recovery System Market Price, Waste Heat Recovery System Market Report, Waste Heat Recovery System Market Share, Waste Heat Recovery System Market Size, Waste Heat Recovery System Market Trends.